Carlin Isles can run like few on the planet, but can he catch the football? 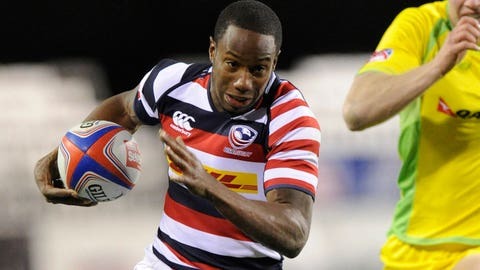 ALLEN PARK, Mich. — Carlin Isles can run like few on the planet, but can he catch the football? The Detroit Lions are going to find out. They have signed Isles, a 5-foot-8, 165-pound rugby star, to their practice squad after he reportedly was clocked in 4.22 seconds when he ran the 40-yard dash during a tryout with the club earlier this week. "I wanted to run a second time," said Isles, projected as a receiver/return specialist. "I would have run 4.1 if they let me do it again; 4.2 to me is jogging. I can go 4.1 all day." Isles participated in Thursday’s practice, wearing No. 16, Titus Young’s old number. Considered the world’s fastest rugby player, Isles has played for the U.S. national team and has his sights set on the 2016 Olympics. That is, unless this football dream works out the way he hopes. If his speed has anything to do with it, he’s got a chance. Isles said he ran 4.13 coming out of high school and 4.16 while in college. Offensive coordinator Scott Linehan watched him run during the tryout at the Lions’ practice facility. "He’s real fast," Linehan said. "I think it was in the 4.2s. Nobody wanted to say because they weren’t sure if it was right, but I think they were all in that range." Isles, 24, played football during his freshman and sophomore seasons at Ashland University in Ohio, but then concentrated on track before picking up rugby. If Isles continues to make a good impression, he likely will take part in the Lions’ off-season workout program and then possibly get an opportunity at next year’s training camp. The Indianapolis Colts and New York Giants also showed interest in him before the practice-squad deal was reached with the Lions. Isles believes he can put on 10-15 pounds to play football. "I can take the pounding," he insisted. "I’m tough and I’m tenacious." Besides durability, the other potential issue will be his ball skills. "I played football growing up, but I haven’t worked on it in four or five years," Isles said. Asked if the new rugby guy can catch the football, Lions coach Jim Schwartz said, "He’s still working on it. When you’re in rugby and you’re catching it, it’s a lot different. "I wouldn’t necessarily classify him as a rugby guy as much as a track guy. He’s got a lot more track experience." Johnson wouldn’t comment on a report that he needs surgery on his right knee following the season. He said a decision on whether he plays Sunday hasn’t been made yet. To replace them on the 53-man roster, the Lions re-signed receiver/return specialist Micheal Spurlock and promoted tight end Matt Veldman from the practice squad. Spurlock was released nearly three weeks ago by the Lions after losing the return jobs to Jeremy Ross. Spurlock got picked up briefly by the Dallas Cowboys before being released again earlier this week, leading to his return to Detroit.